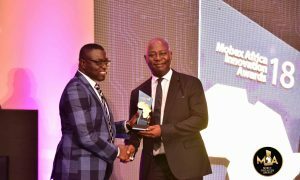 MOBEX AFRICA INNOVATION AWARDS INNOVATION PACESETTER OF THE YEAR, MOSES KWESI BAIDEN JNR. The Mobex Africa Innovation Awards (MIA) is an industry specific awards scheme established to honor excellence, innovation and creativity of enterprises and individuals helping transform lives and livelihood using technology and solving socio-economic problems with the deployment of ICT skills and knowledge. MIA was created to help drive the creative, technical, and professional progress of providing solutions to social challenges, enhancing businesses and evolving forms of social interactions.